Ah, fate. You never know what it might bring you. 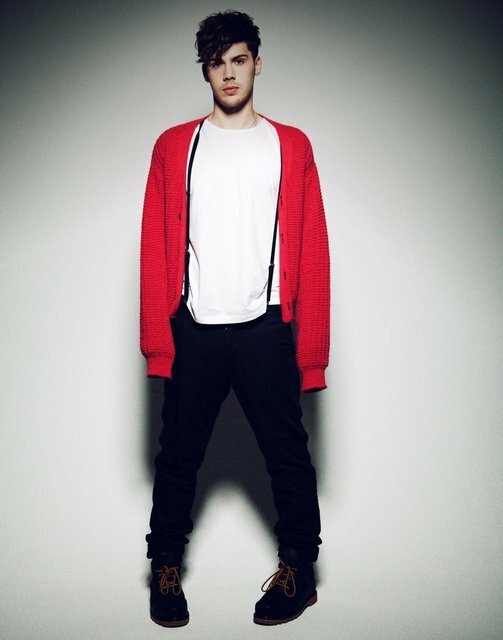 Witness Aiden Grimshaw, who finished ninth in the seventh series of The X Factor back in 2010. Chances were that we'd never hear from him again, but perhaps his being sent packing was a good thing, because ever since then everything seems to have gone, well, alright for young Aiden (he’s still only 20). He knuckled down and wrote and recorded a rather fine debut album, Misty Eyes, which has so far spawned two great singles, Is This Love and Curtain Call. He’s currently on his first headline tour, which hits London on 2 October. When was the very first time you realized you were better at singing than most people? We did Grease in primary school, and I was the dude who sang Beauty School Dropout. I sang my song and I got a big clap, and I thought: that’s sweet. And then my mum said: "Do you want to go for singing lessons?" I would have been about ten. I always used to sing anyway, in my room, to Ronan Keating. "You say it best when you say nothing at all." Not at all, it was the first CD I ever bought. So you took up your mum’s offer of singing lessons. Were they good fun? Yeah, I enjoyed it. We sang all sorts. We started out singing some classical stuff, musicals, jazz hands, all sorts. A favourite back then was Michael Bublé, typical for a 15-year old dude who goes to singing school. I lived in Blackpool, so there wasn’t much going on, gig-wise. My first gig was...I don’t know. I’ve never really been to many before this year, but this year I smashed it. I went to see Kanye West and Jay-Z at the O2, which was really good. When did you actually move to London? Straight after the X-Factor tour, so about two years ago. Oh yeah, I used to come and audition for musicals, theatre and TV when I was in sixth form, so I knew my way around a little bit. Would you still want to act? Not at the moment. When you’ve got an opportunity like this, it would be silly to try and branch out, be a Jack of all trades and a master of none. And then the X-Factor happened. You not winning was probably a good thing. Discuss. I don’t really know, because I never won, but it seems to have gone pretty well. All it is for anybody is an opportunity. I think it’s more about what you do afterwards. You can get caught up in it, but at the end of the day I had to make an album I was happy with, and I made one I’m dead proud of. Take us through your ‘process’. The whole spiel is just me and a dude (Jarrad Rogers, DK) in a shed in the bottom of his garden. I wrote all the songs, he did all the production. So you’ve been in London for a while now. Any favourite places? To be honest I’ve lived here for two years now and I’ve done absolutely no touristy things. I’ve just reached the point where I can go on the tube on my own, ha ha. I just go to where’s closest to my house. So no restaurant tips from you? Nandos in Fulham Broadway, absolutely smashing. Keep fishing for that elusive black card, Aiden. The X-Factor had four black cards, they were just in the house. That’s where my addiction to Nandos started, I’d never been to one before. Was it ever an option to do the album with lots of different people to see what worked and what didn’t? No, I don’t think so. It was always very important for me that the album was coherent and that it fit together as a piece, so I wanted someone to be there from the start to help me tie it all together. Most reviews of your stuff so far seem to boil down to: hang on, this is actually great stuff. Is that a good thing? I think so. If someone was to say to me: Eoghan Quigg from X-Factor 2009 has got an album out and it’s really good, I’d be like: I don’t think I’m going to listen to that, maybe I’ll avoid that one. It’s just an X-Factor thing. But yeah, it’s a good thing, and hopefully we’ll be converting more doubters along the way. What do you listen to yourself? Did you play much music while recording? No, I stopped listening to music, I was scared I would end up stealing lots of ideas. Actually, I lie. I listened to Eva Cassidy’s Wade in the Water on repeat for like five weeks. Breathe Me by Sia, which I cover on my album. Someone suggested it to me, I played it over and over and realised I couldn’t write anything that would fit in that place on the album as well as that song. The album has a narrative. It’s a story of what people go through in time, a break-up, questioning love and life. And is the last song on the album, Curtain Call, a happy end? It’s a happy end, because you’ve identified that obtaining a solution to a problem is unachievable, but you’ve got it all off your chest. I worded that well, didn’t I? Aiden Grimshaw plays Scala on 2 October .